Keep on top of the ways in which the Stim will effect your school at: Schools and the Stimulus from Ed Week. Ken Kay is on the ASCD blog today, so inevitably, a topic of discussion is Jay Mathews' January Washington Post piece on the 'doomed fad' of teaching 21st century skills. Webblog-ed had an eloquent response to the column back when it came out. I don't think I can add much to his critique. Though I've found it sort of astounding over the last two months -- as the original piece has made the rounds on the web -- that Mathews would never have considered the irony in writing an article critical of 21st century skills that requires those same skills to deconstruct it. Hundreds of comments have been filed on this piece. Is Mr. Mathews really still wondering if people understand how to use the Internet? My final exam would be applauded today by promoters of 21st-century skills. We had to plot a course on a Boston Harbor cruise ship, strategizing, analyzing, collaborating. I don't recall understanding any of what was going on, but I turned something in. As I expected, I got a good grade and a bachelor's degree, despite learning no science. ...he demonstrates that he has no idea of what 21st century skills are. Plotting a course on a cruise ship via pen and paper back in the Dark Ages when Mr. Mathews was in college doesn't qualify as a '21st century skill'. Mathews' admission that he 'didn't recall any of what was going on, yet turned something in anyway' seems more representative of the filing of this piece of reactive schlock in the Washington Post than it does of a bygone take-home test. I guess Mr. Mathews did learn something in that class. Mathews says that he's 'nervous whenever I hear of some brilliant new teaching method that is going to sweep our students into a new century'. Well, Jay, it's not the teaching method that's sweeping our students into a new century -- it's our teaching methods that are now playing catch-up to where our new century has already swept our students. In our poorest neighborhoods, we still have some of our weakest teachers, either too inexperienced to handle methods like modeling instruction or too cynical to consider 21st-century skills anything more than another doomed fad. There might be a way to turn them around, but if there isn't, instead of engaged and inspired students, we will have just one more big waste of time. All the more reason to get authentic 21st century learning into our classrooms. Because it's not gonna be Jay Mathews who saves those poor neighborhoods, it's gonna be the best and brightest of our creatively skilled and locally/globally connected 21st century students. And they're gonna need skills. A reader recently emailed me concerning a situation regarding a student caught emailing during class. Turns out the student and several others were engaged in a rather, um, volatile discussion concerning a few other students; there was much crudity and what's to be expected in such teenaged converbalizations. In short, the teacher who wrote to me was distressed and feels taken advantage of by the students. A similar thing happened in one of my classes early in my paperless days. I would say that it's probably the most common problem a paperless teacher will face. So here's some first-hand advice based on my experience. First things first: you have to stop the behavior. I collected the offending emails in my class via a tried and true method: SynchronEyes and a friendly in-house IT guy. Then, one morning, without announcing what I was going to do, I projected the offensive emails (names blocked out) onto my wall. When the students arrived, I was nowhere to be found and my students entered a dark room lit only by the glow of the vitriolic digital dispatches. By the time I decided to enter, the room had fallen into complete silence. And, not saying a word about it, I flipped the screen to the day's lesson and began. And I've not had a problem since. Second, in terms of prevention, SynchronEyes doesn't lie. In the same way that you are liable to be at your best behavior in a court of law, likewise watcher-programs like SynchronEyes tend to keep folks on a short digital leash. That said, one of the downsides of the program is that it may bear too much of a 'Big Brother' feel unto your class. There are times when -- if you are really going to get the students to think outside the box -- you are going to have to allow them the courtesy of unmonitored access. I really believe this. But unmonitored access is something earned; it is not an assumption in my classroom. And this comes down to a matter of respect and responsibility both on behalf of the student and the teacher. I tend to run my classroom on the basis of earned respect; that doesn't change just because we're online. So, in general, I prefer the time-honored tradition of "hands-up". In the same way that this has worked for countless generations of teachers, probably going back to Plato catching Aristotle passing notes, it works for 1:1 computing teachers as well. You are going to have to find out what works for you. And trust goes a long way -- perhaps even further should it be broken. But don't be disheartened; rather, this sort of thing is just one more aspect of teaching students how to live in the 21st century. I find Pixton to be, not a substitute for drawing, but a complement to it. To a serious artist, it is a quick way to try out scenes and poses (and color combinations), and it stimulates creativity. I have not yet found Pixton's limits. I like the idea here that it "stimulates creativity". In other words, although it could be, Pixton is not in and of itself necessarily the end-product. Like the best aspects of Web 2.0 technology -- as well as the best practices for the classroom -- it is open, flexible, and ongoing. It's an ideal brainstorming tool; and in a sense, to use it is to take part in a visual brainstorming exercise. You want to make the most of the stimulus? Invest it in getting teachers and students connected, and in professional development that goes far, far beyond the one-day Powerpoint workshops many are mired in to something that focuses on how learning changes in a networked world. One that helps teachers see the world differently and helps them re-envision their classroom practice. People are in denial of just how important technology is to our world now and people need to help the schools of today out and keep them up to date with the technology of the era. Ed tech plays an extremely important role to our future and it needs to be taken into consideration instead of ignored. As I talk to more folks -- especially teachers -- I see that what we're really experiencing is a 'Boy Cries Wolf' moment in education. For years, theorists and professional development organizers have been rehashing and recycling the same old ideas and presenting them as both something new and something that we just won't be able to live without. Everything that's old is new again. This turned teachers off. Parents too. Now, we're in a situation where the wolf -- the Digital Age -- is actually upon us, and a lot of folks aren't willing to deal with the situation because they've been burned so many times before. Our society becomes more and more dependent on technology everyday. How are students expected to be successful after school if they can't get the education required to work with the new technologies? My generation finds the idea of a paperless classroom strange and I'm not even out of college yet. If I am already so far behind I can't imagine what it is like to be in a high school using out of date computers or even worse no computers at all. Got a question in to Clayton M. Christensen and Michael B. Horn, the authors of Disrupting Class: How Disruptive Innovation Will Change the Way the World Learns during their Education Week chat this morning. Horn's response is pretty forward-thinking about the future of teacher-parent-and-student created Web 2.0 apps. This would be an extension of personalized teaching (that literally could turn on a dime to meet the needs of the student) to a degree hitherto unimaginable. Do you think Web 2.0 apps are going to become the standard both for addressing individualization in learning as well as creating authentic situations in which students with varied learning styles and motivations can collaborate on substantive projects with one another? In our book we project that Web 2.0 apps will play a vital role in the actual customization of learning opportunities--and a result should be exactly what you suggest in the second half of your question. We believe that facilitated user networks will begin to arise that allow teachers, parents, and students to create applications and learning experiences to help other students (and teachers and parents!) understand concepts in a way that makes sense for them. We know that we often learn best when we have to actually teach something; these user networks will provide that opportunity. We suspect that many of these applications that take off will do so first in tutoring applications. Tutoring is a huge area of nonconsumption and one where much innovation can take place. And as if on cue considering my last post, eSchool publishes an article detailing concerns the National Governors Association and the Council of Chief State School Officers have with trying to figure out what can be done about how US students compare to their International peers. Said advisory group co-chair Janet Napolitano, former governor of Arizona and current secretary of Homeland Security for the Obama administration, "The time is now; we must ensure that our students are prepared to compete and innovate in the 21st century". Finland ranked first out of 30 industrialized countries in 2006 in math and science and in 2003 was first out of 29 countries in reading and second in problem solving. Korea came in first in math in 2006, second in reading in 2003, and first in problem solving in 2003. American 15-year-olds ranked 25th in math and 21st in science achievement on the most recent international assessments in 2006. And what is Finland's position on educational technology? By the year 2004, Finland will be a leading interactive knowledge society. Success will be based on citizens' equal opportunities to study and develop their own intellectual capacity and extensively utilize information resources and educational services. A high-quality, ethically and economically sustainable mode of operation in network-based teaching and research will have been established (Ministry of Education 2001). Further evidence for Finland's commitment to educational technology and the development of an interactive knowledge society can be found in these publications housed by UNESCO's Observatory Portal. Ed Tech got a bum deal in this stimulus package. There's no other way to put it. As we noted here before, the $650 million allotment means 20 bucks in tech ed for each of our K through 8 public school students. That doesn't even count high school. Most of the folks on Capital Hill have no idea what Web 2.0 means, let alone do they understand how it is having and increasingly will have an impact on education. The fact that the biggest debate going on in public education in Washington right now has to do with what to rename NCLB demonstrates unequivocally that Republican and Democratic politicians alike just don't get it. What really riles me up is that it's presented in such a way as if Ed Tech is just 'one more thing' or just 'the latest idea' in education. Get this folks: unlike almost every single educational idea that's come down the pike since Dewey, this one was NOT rooted in educational theory. Ed Tech is not some theory that some egghead from MIT came up with. Culture itself has already transformed into the Digital Age. If anything, education is playing a game of 'catch-up' with culture. When it comes to Ed Tech, there's no choice involved. The landscape has already changed. This isn't about buying pretty computers. This is about giving our children the opportunity to actively take part in the global 21st century world. If we do not let them take part; if we do not engage them with technology; if we do not become both efficient ourselves and facilitators for the next generation -- then we are headed for failure. And as a culture we will be so far behind the curve, there will never be a chance again to catch up -- let alone lead. Ed Tech Stimulus would not only create jobs by immediately filling IT positions in every public school in this country; it would not only encourage growth, accessibility, and Wi-Fi initiatives across our urban centers; it would not only create a new marketplace for ideas and innovation; it would fundamentally offer a new generation of students an authentic and fulfilling education. And sure-as-heck we're gonna need the next generation to be smart enough and wise enough and CONNECTED enough to fix all the problems that my generation and my parents' generation created. Labels: educational technology, stimulus, Washington D.C.
All too often, arts education is regarded as a whimsical activity rather than a serious academic subject. In the December 1987/January 1988 issue of Educational Leadership, former U.S. Commissioner of Education and President of the Carnegie Foundation Ernest Boyer argues that the arts should be considered in both an intellectual and imaginative context. I love working in the Department of Fine Arts. I've got a little desk in the television studio's control room littered with computer paraphernalia and a small collection of jazz cds; I teach Art History and a course on Digital Audio Production; and I help maintain a lab of Macs including some in the hall where we project student work. To me, the Fine Arts -- especially in an academic context -- are all about problem solving. To 'make' something is to make a series of decisions. In almost no other discipline is the line between 'getting it' and 'not getting it' so clear. Either you've learned how to make a pot or you haven't. Either you can edit a video or you can't. Everything else is a matter of style and character. And that's why it's so invigorating to teach. Because, in a way, you get the basic stuff out of the way early. What's left is the real stuff of the soul. I would also say that in no other department is technology so naturally intertwined with our everyday work. As I write this, the student TV crew is preparing a live production. It's all a blur of kids hurrying about plotting the digital mixers, switchers, multi-monitor set-ups... let alone setting up the cameras, lighting rigs, and everything else. Across the hall, the drawing teacher is projecting enlarged digital versions of classwork for crit. Next door, a dozen students are busy laying out the school newspaper in digital format. My class is down the hall working on a collaborative blog project that I'm monitoring from over here in my office. More and more, the arts and technology are being merged in completely naturally and beneficial ways. That's the way it should be. The Paperless Classroom: Out Sick! I've received a bunch of emails lately from teachers asking me to post what a normal day's work is like in a paperless classroom. Well, yesterday I was home from school with a sick kid; so, I had to submit my plans to the assistant principal to give to my sub. Here are the plans. I think they give a sense of what goes on on a totally ordinary day in a paperless classroom when the teacher is out and a sub is in. Make of it what you will. Latin I - Vocab Quiz: please create 10 word vocab quizzes for one another. Email the quiz to a partner in class, post answers on your blog, and check as blog comments. Honor code applies! (Must have correct time-stamp). Then, please work on your two blog posts for the week: one on a biography of Julius Caesar (with pictures and sources) and the other on Emperor Augustus (with pictures and sources). Due next class. Latin II - Please be sure that your 'In Verrem' test is posted. For today's class -- Vocab Quiz: please create 10 word vocab quizzes for one another. Email the quiz to a partner in class, post answers on your blog, and check as blog comments. Honor code applies! (Must have correct time-stamp). Then, please work on your two blog posts for the week (to get background info for the Verres Oration): one on a history of Sicily from Bronze Age through the Roman Period and one on the influence of Cicero on later writers and scholars in the Middle Ages. Due Next Class. Latin III - Thanks for all of your hard work on Catullus 37; please be sure that your Cat 37 test is posted. (Must have correct time-stamp). Now please translate poem 39. You may work in pairs. Be sure to highlight and parse at least five verbs. Save in a Google Doc. Due Next Class. AP Latin - Please be sure that your Subordination Test is posted. (Must have correct time-stamp). Then go to Pixton.com. Create a 'comic-book' record of the major scenes in Books 4. Please begin by creating characters for Aeneas, Dido, and Anna as well as a character for yourself. If you have time, get started translating the Bk 4 -- through line 197 due Fri on your blog; note that all text in your comics will have to be in the original Latin. Also, please keep up with the translation schedule; all translations so far this quarter must be posted on your blog by Friday for Mid-Quarter credit. Check my blog for schedule. AP Art History - Please be sure that your architecture test is posted. (Must have correct time-stamp). Classwork: Please curate a small exhibition on your blog of the work of the Realists: Corot and Courbet; compare / contrast their landscapes to the earlier landscape painting from 16th and 17th century Netherlands / Flanders. See Met Online Timeline for ideas. Please source each pic via hyperlink. Just think of all of the classtoom uses for a handheld Van de Graff generator! New Tools Catching Up to Old Ways of Thinking? Why not just let them use all of the tools at their disposal and re-design the assessment so that it fits into the real world (or virtual world) of practice. Why use new technology for old methods? "Tools at their disposal" is the operative phrase. The possible future advantage of smartphones is cost. For a fifth the cost of a laptop, a student could potentially go Wi-Fi directly into all the tools Web 2.0 has to offer. This could be a practical way to close the digital divide. With regards to "why use new technology for old methods", I have to admit not following that one entirely. We're not talking about "re-designing" the assessment so that it "fits in" to anything. We're talking about working within and beyond the new and evolving dimensions. I guess what I'm getting at here is that we don't even know what the "real world" is going to be. Certainly, computing in 2009 has little in common with the computing of 1999; and surely the effect that has had on culture has been dramatic. There's likely more folks renting video games than movies on any given Friday night. Furthermore, when I am teaching my Latin II class about Julius Caesar, I have little interest in whether or not they know the date on which he was assassinated; I care that they understand and can reflect upon why he was assassinated and what his death represents. Wikipedia has made what we used to call "book knowledge" (or "cocktail party knowledge" depending on your inclination) virtually negligible. In short, knowledge just ain't what it used to be. So, if I just "update" my assessments to "new technology", but fail to see what the new paradigm of technology has done to the value of what it is that my old assessments represent, then -- at best -- I am taking part in a futile task. Of course, good teachers have always known this. And I'm sure that many of you are saying to yourselves: "But I've always been more interested in the 'why and how' than the 'what and when'". Well, then this moment was made for you. Because the future of education within the dynamic digital paradigm is a future of questions, not mere facts. And it's not that the technological world has instigated this, rather it's that the technological world has finally caught up to this. In response to yesterday's post on virtual environments, I received a bunch of mail about Second Life. Perhaps I should have posted on my experience with Second Life before posting on MMOGs, but that's okay. Second Life -- ideally -- is a virtual world created by its inhabitants (called residents). In this way, you can do many of the things I suggested in the last post -- such as create your own environments and historical re-enactments -- although the graphics pale in comparison to World of Warcraft or several other MMOGs. That said, the real difficulty I've had in bringing Second Life to the high school classroom is that it's no place for minors. Well, the very thing that makes Second Life so unique -- the fact that it is entirely created by its users -- is also the same thing that makes it such a difficult place to take students. I would encourage all teachers to log on and create an avatar; there's a wealth of great stuff in there: everything from Community College distance classes to lectures in Princeton University's Second Life campus to tours of world capitals to great online avatar-customization shopping centers. But I dare any newbie to the Second Life world to not innocently find themselves lost and end up strolling into a rated-X part of town. As an adult, you should be able to handle that. But a 14 year old? So, Second Life remains a virtual destination for college students and adults. And that's fine. And there's a ton of cool stuff to see and do once you are there. But, there's too much of a disconnect for touring with kids. See, the difference in an MMOG like World of Warcraft is that the virtual environment has been created by the creators of the game whereas in Second Life, so long as you have the virtual money, you can create whatever you want. Second, MMOGs usually have GMs (Game Masters) working the environment so that if a problem arises, it's settled quickly. In Second Life, there is very little in the way of policing. Now, there is a teenaged-version of Second Life. But I haven't been there (not being a teenager myself...) Perhaps you could send a few crack students in to do some reconnaissance. I imagine that there's got to be some way to work out the basic problems. Will SmartPhones be a viable alternative to Laptops for school and work? Thinking about video games. Well, not just 'video games', but MMOGs -- Massively Multiplayer Online Games. Ed Week has got an interesting piece on gaming that ran a few days ago. While the piece stresses the way in which players can handle multiple situations at once, (and of course what that implies about the human thinking apparatus), I find it even more interesting to think about what extreme gaming has done to the visual and experiential expectations of students. Why are we trying to convince students that VRoma is a virtual environment when they've already toured all over the virtual environments of Azeroth? Go ahead, click that last link and watch the trailer. Then you'll get an idea of what our kids 'expect' when we talk about 'virtual environments'. I, for one, think this is a good thing. The kids are ahead of us. That puts us into the position of either catching up or becoming technologically irrelevant. I see this as a great challenge and a great opportunity. Why not engage in co-ops with game makers to create authentic virtual learning environments? Why not teach the Civil War by actually taking part in a virtual reconstruction of it? Why not teach the Theory of Relativity by living as virtual characters in Einstein's world? Why not learn US Government by living and working within a virtual US Congress? I see a real future in merging ed tech with what's already going on in culture tech. Well, for my needs, it means making the assessment tool the only application available to the student. The best scenario, though, would be to have that configurable, so that not only could they have, say a OneNote page to write their responses and Maple or Geogebra to try out their ideas but not have access to previous notes in OneNote nor social-networking, etc. And this has to be dead-easy, one-click on, one-click off kind of configurability on the part of the teacher. Two ideas: one totally lo-fi and the second an easy-to-use program. First: "Hands up! Spot check!" The teacher tells the students at the beginning of the assessment that there will be random spot checks. Anyone who has an illegal browser / program open forfeits their grade. Anyone who continues typing forfeits his or her grade. Students just flip their screens around for the teacher to spot check. I use this method all the time and generally after you catch a student the first time, you never have another problem. Second: SMART sync 2009. This is the new version of SynchronEyes. It gives you one-button control over all student computers. You'll be able to monitor each screen in your room and you'll be able to block and/or control student machines and access. I've used SynchronEyes in a 'language lab' type of setting and it worked just fine. You can even use the program to create simple self-grading reading-checks. TeachPaperless is now a healthy 19 days old! This is post number 67. 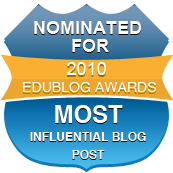 I just wanted to thank all of the people throughout the paperless classroom and educational technology community who have helped make this blog so successful here in its early days. We've had thousands of page views, hundreds of emails, and dozens of comments over these last two and a half weeks and I have to admit to being a little bit overwhelmed. But I believe that the community that is carrying on discussion here, as well as (hopefully) carrying the discussions on into the 'real' world, is a community that cares about the future of education and is a community that is fearless in being willing to experiment, change, and challenge each of our own preconceptions in these unsure yet pivotal times. Know your history, be aware of your present surroundings, and go into the new frontiers: Teach Paperless Now! I want in! Thanks for clarifying. So basically, each student gets a Palm Centro, Blackberry, or other Smartphone loaded with education "stuff." Love it. The only drawback is the keyboard but that shouldn't be too complicated. Your keyboard worries aren't worries anymore: check out these portable PDA keyboards. I can totally relate to your desire and need to listen to music when one is working physically and mentally. I too grew up listening to music while doing homework in the kitchen and watching the first videos on MTV while doing homework in college. I feel much more relaxed and creative with good tunes playing in the background. When I clean the house, I blast a medley of old punk music on my IPod like the Ramones, Sonic Youth, and the Replacements. When my family is eating dinner or doing quiet work, we are listening to Wilco, the Lemonheads, or Cake. In turn, we have raised our three kids to appreciate all sorts of music, and they too fill their lives with their own music and other artists' music. We remember certain new CD releases when we think about certain road trips and family events. We often think about how empty life would be without song. I too enjoy playing music during class when students are working on quiet assignments. I will use Pandora more often now based on your suggestions. I have mostly relied on my IPod, but then students spend too much time critiquing my music instead of working. At least with Pandora, it feels less personal, even though certain styles of music play based on the teacher's or students' choices. I am really glad to read your blog, because I second guess my choice to play music while students are working. I don't want to distract students either, so I am sometimes nervous about playing tunes during work. I do, however, play music at the start and end of class. I get a kick out of surprising students with my selection of music, because you see I too am an "old punk rocker." What are we talking here? Using student supplied cell phones as modems for internet access? My wife's business has thin clients. Nothing is actually stored on the desktop machine. Everything is done from a server? Is that what we're talking about? Educational software for cell phones, a suite of tools developed at the University of Michigan, is being used to turn smart phones into personal computers for students in two Texas classrooms. Yup. SmartPhones. Just run 'em into monitors. And voilà: SmartDesks. "This is the beginning of the future," Soloway said. "The future is mobile devices that are connected. They're going to be the new paper and pencil." Cell phones can be powerful computers, Soloway says. They can do just about everything laptops can do for a fraction of the price. And many students are bringing them to school anyway. Read the whole article here on Physorg. A recent Johns Hopkins' hospital study shows that going paperless may be better for you than you think! Estimates are that netbooks will hold 12 percent of the world’s entire laptop market next year, which is amazing when you think that the Eee PC is less than two years old. And their adoption says a lot about how we think about our computers these days. If each desk had a keyboard and screen, you could just plug in your phone/computer and start working. That would be very convenient. What a great idea. Why spend the money on $700 - $1500 on laptops for each student when we could just buy a $100 monitor and a keyboard / mouse for each desk. The student then just plugs in his or her phone and goes online. A colleague caught me reading the latest issue of Wire this morning at a faculty meeting. Immediately he teased me about reading a 'paper' magazine. I realize he was joshing me and I took his remark with a laugh and gave him a remark in return. But, his observation made me think now's the time to address an issue about a paperless classroom. Namely: I am not against books, magazines, newspapers, and everything else printed on paper. Rather, I see their time on this earth -- in terms of continued production -- as limited. I don't think it's a 'flying cars' pie-in-the-sky idea to say that twenty years down the road we probably won't print most books, magazines, or newspapers on traditional paper; SmartPaper is coming, and it will gradually become as common as cellphones are today. Think about this next time you look at a Kindle: if I were to have handed you a full-sized car-phone in 1985 and told you that someday in the future you would not be able to live without this thing, you would have told me I was crazy. Rather, we should understand the present that we are in right now as a sort of transitional or liminal stage. In a way, what we do and envision now in terms of the possibilities both for bringing our traditional paper mentality into line with a paperless future as well as dreaming up new sci-fi visions of that paperless future will be instrumental in creating the type of world we are about to enter. My first-year Latin students recently read several myths from the classic Wheelock's Latin accompaniment called 38 Latin Stories. They then spent a class-period designing digital comic-book versions of the myths. These were posted to their own blogs and, on the following day, each student presented their work to the class by translating their comic strip (without notes or a written copy) and leading a discussion about the meaning and purpose of the myths. In this way, we brought together traditional paper-book reading and translation prep-work; a digital means of tapping into visual and conceptual intelligence; digital archiving on the blog for future reflection, portfolio, and final exam prep; and interpersonal class presentations demonstrating understanding both through public speaking skills and the ability to translate without notes and to answer unscripted questions about the myths. It is the synergy of all of these styles of learning that made the project successful. It wasn't because of some rigid dogma to being paperless for it's own sake. 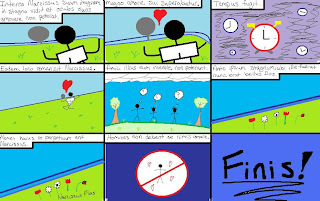 The paperless element just makes it that much more dynamic: now I could give each of the students a comic-strip by another student and ask them to translate and analyze it on the final exam. I could give a strip to one of my students who is concurrently taking a video class and she could use it as the storyboard for setting up shots in a movie. Or I could give it to one of the animation students in a colleague's class and they could turn the comic-strip into an animated movie using the actual original digital drawings as the animated characters. Or I could even do something as simple as asking students to parse the verbs in each others' blogged comic-strips, draw a digital icon for each word, throw the icons into Flash, and create interactive visual vocab quizzes for each other. You could, of course, just as well draw your comics onto a transparency sheet to present to the class. But then the presentation remains the end product. The great thing about having a paperless copy is that it remains a 'means' and it can be altered, it can be returned to and redone, it can be customized and recustomized, and it can be easily spread around, distributed, and reinterpreted by a dynamic group. With paperless projects there is no 'final product', and though counter-intuitive, that's actually one of its most simple and powerful assets. 'Paperless' is not about dogma. It's about possibilites. "Year after year, when students are asked on our Speak Up Survey what they'd most like to have, I get the same answer," said Julie Evans, CEO of Project Tomorrow, a national education group that publishes the largest annual survey of student, parent, teacher, and administrator attitudes toward school technology. But it's not the specific nature of the device itself that kids desire, she explained; instead, it's what a laptop gives them: the ability to control their own knowledge. According to Evans, a laptop serves as a proxy for intellectual freedom--and with recent advancements in handheld and smart-phone devices, these technologies can offer much of the same experience, at a typically lower cost. There's been a bit of talk about this in comments as well as emails I've received related to earlier posts. So, what do you all think? Let's take a poll on ask500people: Will SmartPhones be a viable alternative to Laptops for school and work? The music of the Bee Gees makes me want to destroy things. I should give some context, perhaps. You see, I live in a very old house built during the brief tenure of William Henry Harrison as commander-in-chief of these States and therefore my wife and I often find ourselves spending weekends doing things like reframing doorjambs and replacing kitchen floors. This last weekend we demolished our bathroom -- taking out all of the walls, fixtures, and plumbing from the "modern" 1927 addition to the house and replacing everything with more viable alternatives. And throughout the demolition process, we listened to the Bee Gees' Greatest Hits. On repeat. This is a tradition that started years ago when we bought the old house. Back then it had holes in the roof and no working front door; you couldn't safely walk across the dining room floor for a while without fear of fall through into the basement. We worked on the house for weeks to make it livable and to pass time we listened to music on the portable cd player. Only problem was -- and this is inexplicable and embarrassing for an old punk rocker like myself -- the only cd we had in the house was the Bee Gees' Greatest Hits. And so a tradition was born. Each time we demolish some part of the house, we listen to the Bee Gees. And inevitably, whenever I hear 'Tragedy' or 'More Than a Woman' played at the shopping mall or at the doctor's office, I immediately begin to develop a desire to swing a sledgehammer through drywall. I tell you this because I have been thinking a lot recently about the power of music to 'locate' us in a place. When I was growing up, my mother always yelled at me for listening to music while I was doing my homework; but I think it rather eased my mind and made me more interested in the work at hand. I listened to jazz incessantly all through college and still can't hear Miles or Monk or Dolphy without totally grooving into my analytical state of mind. And so, in opposition to the advice of past mentors, I most often have music playing in class. I stream everything directly from Pandora which allows for some useful pedagogical techniques. Pandora is an Internet-based music system within which you can create your own 'radio stations' which then stream music based upon what artists or styles you 'seed' the station with. So, first, because I can set the general range of what is going to play (in terms of style or genre) I have an idea about what we're going to listen to, yet I happily remain surprised myself at what often come out of the speakers. In other words, just having music play softly in class -- and allowing Pandora to choose what we'll listen to on a song-by-song basis -- actually helps invigorate my own very audio-oriented mind. Sometimes I'll hear something I either had never heard or something I haven't heard in a long time and I'll suddenly feel a spark go through me pushing me to dig further into whatever matter at hand we are covering in class. Second, music is a wonderful class management tool. I will often sit down and talk with the class before assigning an in-class small group project. I promise them that we can listen to music so long as they keep on track. On those occasions when we have individual work to do, the music often transforms our admittedly rather mundane classroom into a swanky cafe where the students actually tell me that they feel different about doing work than in other classes. Third, music and sound is absolutely the most common yet least utilized pedagogical tool. When I am leading a discussion about Baroque Italian art in Art History, I've got Pandora set to play Italian Baroque music. When I'm teaching loops in my Digital Audio class, we listen to Hip-Hop. And none of the students have yet to put together why we listen to so much Brazilian and Cuban music during Latin class. Because I am convinced that the audio-locations set into their minds and memories through the streaming of hour-upon-hour of Portuguese-rendered Tropicalia will act like a bookmark ever linking the Romance Languages to their Latin Roots. Check out Pandora. Just refrain from playing any Bee Gees while I'm around. How Do You Check For Plagiarism Online? How do you check for plagiarism with Google? Please cut-and-paste and then Google the first line and the last line of the first paragraph of the following essay. It's from an piece on The Great Gatsby that I received a few years back from a student with little understanding of how Boolean searches work. Is his novel the Great Gatsby, F. Scott Fitzgerald creates Gatsby -- a character who becomes great. He begins life as a regular, lower-class, person. But Gatsby has a dream of becoming rich. He has a reason to strive to become prominent after meeting Daisy. Throughout his life, Gatsby gains the title of truly being great. Even before Gatsby is introduced, he is hinted at being different. The evidence of this is when Nick says, "Gatsby turned out all right at the end." (2) Nothing was known about Gatsby at the time and Nick is already saying Gatsby was all right. Gatsby is mysterious. Everyone knows of him, but no one knows who he really is or where he comes from. Even at our first glance of Gatsby, no one knows Gatsby. You can go on... but why bother? This is a classic case of Internet plagiarism. Cut-and-Paste from an essay service. In my classes, I often begin introducing an essay topic on a given book by pulling up a few essay services and looking at what they have to offer. In general, the essays at 123HelpMe, eCheat, BookRags, and GradeSaver are just awful. The kids actually get a laugh out of looking at all the ways people cheat on essays, but they also realize just how easy it is to get caught and just how stupid it is to take that chance. One thing I would not do is just go and nail a kid for plagiarism without going over it in class first. So make a lesson out of it; I find it actually makes for a great class period and you get to share quite a few laughs with the kids. I'm already in line outside the Mall of America Apple Store in Bloomington, Minnesota to be one of the first to get my hands on an iCheap. At $20, I'll spend $600 of my own money to outfit my classroom. Anyone who brings me a slice of cheese pizza from Pizza Villa gets a hug. I'll be the one propped up against the glass wall with my sleeping bag. $650 million for educational technology, such as computers in classrooms. That doesn't count various incentive programs, teacher training, and building modernization. But those things are not explicitly slated for a tech budget and certainly would include and involve many non-tech things. I'm no economist, but I think that a stimulus bill that provides only a minuscule of its resources towards the future of technology in education is more than shortsighted. Think about it: as of the 2007 data collected by IES, there were some 34.6 million students in public pre-K through grade 8 alone. Regarding a $650 million investment in technology, that comes out to less than $20 per student. Am I missing something? Has Apple developed a new iCheap laptop that only the federal government knows about? I am very wary of turning in essays on a blog, simply because there is so much plagiarism going around. It would both put hundreds of essays out there, for students to copy, and for students to submit via copy/paste. Granted, it's not difficult to plagiarize on paper, but with paper, there is no option to "delete entry." The evidence is there, turned in by the hands of the students. I've actually caught more cases of plagiarism since going paperless. Every now and then, I take classtime with my students to run Google checks on anonymous blogged essays their peers have turned in. Inevitably, we find copied work. Rather than bust students and deal with it in the standard disciplinary way in the event we do discover fault, I use it as a means to show them how easy it is to discover plagiarism in the digital world. The kids learn quick and I've never had to do this more than once with any class to completely discourage digital copying. It's actually quite a bit more difficult to do that with just paper. And as for the concern over "delete entry"... let's just say that few things you ever write online actually disappear. And if it's a blog, and you've subscribed to it, you actually get sent a copy directly to your inbox or newsreader. The writer can't take it away from you. With paper, there are no accusations that the teacher may have manipulated the essay, through a word processing program. Most blogging apps leave a time-stamp and author signature on the post. Consider that one safe-guard to any accusations. It's got the student's name on it and it's got the exact time and date that they posted it. Just refuse to accept any work that's not posted with a time-stamp. I'm an 8th grader from Washington State who has been working on a project concerning paperless schools. In our research we found a website that equated a ream - 500 pages of paper - to 6% of a tree. From this number we calculated that our school of 220 students uses 45 trees worth of paper per school year, and we have been taking steps to inform our classmates about that. Thanks for your research; you've got a whole lot of trees out there in Washington State to take care of! Keep up the good work! SharePoint? Its "use" has killed the technology progress we've made at our school as far as I can tell. And we're a decade-old 1:1 tablet/laptop school. We "implemented" it at the beginning of this school year and the level of communication and the depth of information available to faculty, students and parents has been horribly affected. The learning curve is tremendous -- just putting up a picture on to a page requires considerable effort. It's a system built for database programmers, not teachers. After complaining all fall, two weeks ago our IT director finally relented and allowed us to use other tools other than those offered by SharePoint. Of course, the faculty had already invested a considerable amount of time fighting with SharePoint and so few are making the change. A whole year of work and an astonishing amount of momentum and good will evaporated by this monstrous system. Bitter? Yeah, a little! A growing number of testing and learning experts argue that technology can dramatically improve assessment—and teaching and learning. Several new research projects are demonstrating how information technology can both deepen and broaden assessment practices in elementary and secondary education, by assessing more comprehensively and by assessing new skills and concepts. All of which can strengthen both national standardized tests like the National Assessment of Educational Progress (NAEP) and classroom-based tests meant to help teachers improve their instruction. You know, all things considered, should we really be assessing technology by how it can improve standardized test scores? ...the new research projects have produced assessments that reflect what cognitive research tells us about how people learn, providing an opportunity to greatly strengthen the quality of instruction in the nation's classrooms. Other fields, such as military training and medical education, are already using technology-enabled assessment to enhance teaching and learning. And with all due respect to military training and med school, but they are both fields where "training" is the operative word. They are fields where mostly you learn HOW to do things more often than you question WHY to do things. And that's fine; after all, I want my doctor to know my appendix from my liver when he sees it. But that fits into the comfort zone that most people already have with technology in education. That is to say, we know that computers are pretty good at "training" people. But the future is not built on present-day training. We really have no idea what's for store for us in the future. The future of tech in education has less and less to do with training and bubble-tests and more to do with opening up our intellects and the wonders of our communicative and imaginative minds to the unknown. So let's make it up. Let's create the future. Abandon standardized tests. Shelve the manuals and open up the poetry. Scrap the courseware and start a blog. Meet the kids where they are and maybe you'll find out something about where you are. SharePoint: to buy or not to buy, that is the question. Ostensibly, the purpose of SharePoint is to help people collaborate more efficiently. And to achieve this goal, one need only pay a few thousand dollars and wade through page upon page of tech "help" mumbo jumbo. The sad truth -- and I say this as a former SharePoint user -- is that there is nothing you would use SharePoint for in a classroom setting that you can't do via Web 2.0 applications. And whereas SharePoint costs an arm and a leg, Web 2.0 apps are by-and-large free. 1. Calendar -- In SharePoint, all of your classes are located on different cals and each requires log-in or shifting between classes. In Google Cal, all of your classes can be accessed on the same calendar in one click. And Google Cals are subscription-based, so information entered into the cal can automatically be sent to subscribing students' inboxes with the click of a button. 2. Dropboxes -- These are the bane of my existence. Why upload a text document when you could just as well post on a blog? We're talking minutes of your day being wasted, people. Not to mention the fact that all of those documents are more than a bit unwieldy. I know folks who have quit using SharePoint on the basis of the dropboxes alone. Ok, so where were we? Oh yes, SharePoint: needlessly time-consuming calendars, stone-age dropboxes, and a Byzantine help system. Oh, and you get to pay for it. But that's not the real problem with SharePoint. My issue with it is that it's a platform that has "the past" written all over it. New Web tech is all about the free flow of information and an open and dynamic way of thinking. It's rooted in customization and the ability to use technology in your own way. SharePoint is proprietary to the nth degree. If technology is a tool, then SharePoint is a hammer that chooses its own nails to the constant chagrin and annoyance of the carpenter. What concerned me as I sorted out bags of papers I had brought home from school at the end of 2008 was the sheer amount of paper that the administration had wasted on us teachers. I think it could all have been said on a blog or wikispace but I was left with 3 full garbage bags. Consider if you will the average faculty meeting. Did you remember to pick up a blue sheet? And make sure you have a pink one and both of the yellow ones. The white sheets are a copy of the PowerPoint we're going to watch; you can take notes on it to review later. First of all, the reader is absolutely correct that basically everything that the administration printed out could just have been posted on a blog. Second, if the information is posted on a blog, then it can be responded to and discussion can continue long after the meeting ends. We all know that there are those things we need to talk about but are just too tired and hungry to stay at a faculty meeting until 5PM after teaching all day. The blog solves this problem. The admins can present the info, we as a faculty can have a discussion, and then that discussion can continue to happen online. It can also be revisited. How often have things come up in meetings that seem so urgent but then just disappear into the educational ether? Well, the blog acts as a dynamic record of the event. Third: why the heck do people print out copies of their PowerPoint? It's digital. If you want me to have a copy and mark up notes on it, just email it to me in advance. I'll bring it to the meeting on my laptop and mark it up as a word document the same way I mark up student essays. Every time I see papers handed out at a meeting, I see piles of money that could have been spent on art and music and technology just squandered. At the very least, please see to it that there be a recycling box next to the exit door. A few days ago, I commented on just how cool the new Google Ocean is. Here's a lengthy and entertaining radio interview with Sylvia Earle, the renowned scientist behind the project. The 'Computers for Learning' project of the US General Services Administration collects older computers for reuse. The CFL program specifically matches the computer needs of schools and educational nonprofit organization with excess equipment in Federal agencies. This could be a great way for schools strained by the economy to gain access and connectivity. Q: Is a Paperless Classroom Possible? That comes out to about 50/50 likely vs. unlikely. Weblogg-ed is thinking about Facebook. I read that as a whole lot of parents and teachers are dipping their toes in the pool and at least beginning to come to terms with social networks. Whether they can see the potentials for learning is another discussion. But I can’t help but think this conversation for reform which includes teaching kids how to learn in networked publics and online communities will be given a boost by their participation. Years ago, back when schools found out that kids were on MySpace, there was a great deal of trepidation in the ranks of educators. Fears of perverts lurking in the digital shadows and all that. But then we all started using social networking sites. MySpace turned out to be a cross between an old-school shopping mall and a really big record shop. Facebook has turned into an interactive address book and organizing calendar. Much of the fear is gone. People are starting to feel comfortable in the digital world. They see that it's not going away. In fact, it's becoming more and more necessary. I'll give you an example from my alternate life in music. I help run a venue in Baltimore. Twice a month or so, me and the other organizers get together and listen to a bunch of submissions. Almost every single one of those submissions comes through MySpace. Back when I was a kid, we had to spend our hard-earned money and product schlepping records to local clubs in exchange for gigs. Tours took forever to plan on your own, and we all had stacks of out-dated phone-numbers and addresses of promoters and venues across the country. Now, booking a tour is as simple as planning a time-frame for going on the road and emailing your MySpace link to promoters and venues; usually just takes two quick emails to secure dates anywhere in this country or most others. Which gives you a whole lot more time to actually kick back and hone your chops. We couldn't break down the figures for the curriculum but we realised that at least 50% was for memos to all staff - paper that would be looked at probably once and then put in the recycling bin. And that's when we realised that we could have a central intranet in the school containing all that information, divided up for pupils and for staff. That was what we identified would free up the paper. The quote is from the tech teacher at a Scottish high school that's gone mostly paperless. The article is full of great paperless-driven cost saving techniques. How much money do you spend making copies? You might think this is an exaggeration, but I've talked to many educators who work in faculties of around 60 teachers where the standard max paper use before you need to ask for an extension is 15,000 copies per year. That means that the school fixes its budget on the idea that teachers are going to make on average 83 copies per day. In a faculty of 60, that averages to just shy of five-thousand copies a day. A digital classroom is on the verge to be here already. The only exception would be Elementary grades teaching writing by hand, which could turn into a useless learning in 20 to 50 years. So, my question to you fair readers: Is Handwriting on the Way Out? I've used the Google form for both self- and peer-assessment rubrics (no more sheets of paper to enter manually!). And we've posted links on bulletin boards to collect data from the school community. I'm also working on admin using a central Google Doc for our daily information (who's away with what sport when, etc) to cut down on emails and such. A central Google Doc for daily announcements, schedules, etc, is long passed due. If your school has a TV studio, you could even link to the moderator in charge or to the student members of the production team. They can then pull directly from the site for prepping broadcast announcements. New bloggers: this post is for you. Your blog produces a feed. Sorry to be the one to break that to you. No, actually this is a good thing. Because blogs are essentially subscription-based (i.e. people who use RSS news-readers like Google Reader can receive updates each time you create a new post), you can also use the subscription feed your blog produces to keep track of your students. This is going to be a little two-part post/lesson. Part one: How subscriptions work and how to use a news-reader. Part two: How to monitor blog use through a burning service. Ok. Let's start with the whole idea of new-readers. Basically a news-reader is a portal through which all of your blog subscriptions are managed. Afterall, isn't it kinda time-consuming always having to go to the websites and find the new information you are looking for? Instead, you can use a news-reader (sometimes called an aggregator) to cull through all the new posts on your most-watched blogs and compile them in one place. To do this, you need a news-reader and you need to subscribe to the blog's feed. If you've been following this blog, you've likely already set up a Google account. And when you did that, you in fact got hooked into the Google Reader service (which is their news-feed aggregator). Just click on the 'reader' tab in Google and you will see how the reader works. It's basically set up to look like an email account, except instead of email you receive current news and posts from blogs you've subscribed to. So, now let's go and subscribe to some blogs. If you like, you can go ahead and start with TeachPaperless. Click on the orange broadcast icon on the sidebar of this blog. This will take you to a page where you can choose which reader to use (in addition to Google, there are many choices from big names like Yahoo to more boutique readers like Rojo, but they all basically do the same thing [Ed. - Advanced readers, please refrain from flaming me on this issue; instead work off your angst at the fact that I would dare equate Yahoo and Rojo by going off on a quest with a few buddies to take down a clan of level-80 Yetis with your orc warrior... we'll get to advanced issues down the road; this is a post for folks who just want to learn how to subscribe to blogs]. But, I digress. Ok. So that's how a news-reader works. Now, for each blog you regularly read, you can set a subscription and receive all your news in one place. Now, in terms of burning a feed, an easy way to go is Feedburner. Just enter your url and let Feedburner do its thing. Once your feed is burned, you can just follow along through the tabs to optimize and publicize your blog. Now that you've got a service tracking your blog, you'll be able to see how many subscribers and hits you get. In terms of classroom maintenance, I often track my classes to get a sense of how many students are actually following my blog (as they are required to do). If I see my numbers slipping, I throw an unannounced pop-quiz onto the blog and by the time I grade it I see my numbers back up where they should be. What can we all do to get students to think for themselves and become more physically active in their daily life? I know that I am almost lost now without the tablet in front of me when I am working on assignments. Also, I need to force myself to get up, do something physically exerting because I am sitting way too long behind some digital tool. In my own experience, the ease-of-use technology offers actually presents me with the opportunity both to be more productive as a teacher and at the same time have more time get out and do the other things that make life fun. For example, a relatively simple thing like Google Images saves me hours of prep-time for my AP Art History class. In college, I worked for a professor who taught a Roman History survey. He paid me to go to the slide registry at the library and collect hundreds of images for his class presentations. It took weeks to complete that work. Now, using Google, I could put together a comparable project in a few hours' time. Which leaves me more time to get out and enjoy some sun. Also, you could do a calculation on how many trees you are sparing (I haven't found a definitive number for this yet so if anyone has a reference, much appreciated). Ok, TeachPaperless Readers, the challenge is on: what are the real numbers in terms of trees cut down in relation to paper consumption? I had been thinking about it in terms of methane and noxious gas emissions related to paper production and then in the ultimate landfill breakdown of paper, but I'd love to know the real numbers in terms of logging and manufacturing. You can use the Google Forms (inside Google Docs). Create a form for them to fill out and it goes directly to a spreadsheet in your Google Docs. Perfect for feedback, exit slips, or quick information sharing. Keep the Google Docs ideas coming! Anyone in Washington state should check out the OSPI Peer Coaching technology grants -- you get a ton of money (9K!) to buy tech and participate in training to coach other teachers on integrating tech into the classroom. It has been a truly inspiring experience, and a wonderful excuse to push the tech issue at my school. Check with your education service district. How do you encourage students to read the entire novel online? While I encourage reading online, in no way do I ever discourage reading real paper books. As I've written before, it's not paper I'm against -- it's a paper-knowledge mentality I'm in opposition to. I do think that Open Library and upcoming handheld devices are going to make it much more comfortable to read online in the future and I (and my strained eyes) look forward to that day. In terms of actually using a novel in class, however, I always post the sections we are doing a close-reading of up on the wall via an LCD projector. It's then easy for me to mark it up via my tablet-PC. Often I will then post the day's notes to my blog as jpgs. In addition, my students mark up their own digital copies of the text and save their notes on their blogs. Over the course of the year, the students unwittingly develop a wonderful digital portfolio that demonstrates their progress. And -- and this is something else cool about the dynamism of Web 2.0 -- is that the students can go back, revisit their notes, and link their notes to digital sources and scholarship online. In effect, their notes taken in class -- written on a digital version of the very text itself -- becomes a hyper-linked annotated bibliography. That's something that you just can't do via an overhead transparency. I am putting together a Moodle initiative for our district of roughly 12000 students. I asked our environmental manager for some data on our paper use. From March 08 through the present, we have blown through almost 4700 cases! Some quick math: 4700 cases x 10 reams per case x 2" high per case amounts to a stack of reams over 7800 feet high. The Sears tower is something like 1700 feet high (with antennas too). I don't even want to calculate the costs. Any chance of teachers posting links to their online class pages so we can compare notes? If you comment the links, I'll organize them into a sidebar list. I am having students use Google Documents to write their assignments and then share the document with me. I can grade them at school or at home and can type my comments right into their document. You can also open up the Google Doc and share it with classmate partners or teams of students for peer review. Google Docs will actually track the changes each Doc member makes, so you can even grade students on the quality of their editing by going back and looking through the history of each revision on an individual contributor level (sort of like what you can do on Wikipedia when you check the history of a wiki). Explore the depths of the ocean... online! The National Science Foundation and Google have partnered to develop 'Oceans in Google Earth'. This is really cool stuff. It allows you to explore underwater geography and includes features written by National Geographic and the BBC. Download the 'Oceans' layer here. My goal is to convert my whole school and then the district. I know it will take data to prove the savings before the district will spring for more computers. First off, practical stuff: Connectivity and hardware are going to be your initial expenses. If possible, you should also have a tech person on-hand for repairs and service issues. Second: All districts are different. Do most of your students have computers already? Or do few? Are your teachers each equipped with a laptop? Or do you have to scramble on your own to flush out tech needs? Third: Consider this... I don't know exactly what your situation is, but I would suggest going totally paperless in your own classroom first. Then use the leverage it gives you with regard to ease of parent conferences, simplicity of iCal, ongoing assessment via individualized student digital portfolio blogs, etc... to get other teachers onboard. Rather than trying to sell the paperless classroom as a way of 'saving money' on paper, try presenting it to your faculty as a way of making classroom time more effective, grading more time-managable, and student outcomes more authentic and dynamic. Because in the end, this isn't just about saving paper... it's about saving students. Once the other teachers realize just how effective and easy it is to use a digital classroom, you'll begin to develop a critical mass. That'll wind up being a lot more effective in the long run than just one person trying to do all the work. This is essentially a collaborative venture we're all embarking upon. No one of us can do this alone. We need that critical mass both to evaluate best practices between each other and to influence the powers-that-be that either they jump on the train with us or take the long walk home alone. How do teachers grade formal writing effectively and efficiently online when you have a student load of 100? I have tried countless times to grade from the dropbox, and I always end up giving up, because students are sloppy about submissions, I can't grade easily on the go, and it takes a much longer time to open the documents. Dropboxes are a pain in the keester. 1. 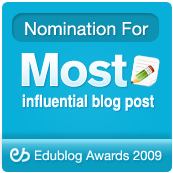 Have the kids post their essays on a blog. There's no reason why you should have to manage dozens of unwieldy Word documents. Plus, if it's posted to a blog, you can easily grade it from anywhere you can connect. 2. Cut-and-Paste the student's essay into a Word program. 3. Comment on the paper in 'Comments Mode' and record your grade. 4. Email the edited version back to the student. Bam! You're done! The one thing the super-savvy among you may try is to convert the paper into a pdf before sending it back to the student; you can do this in Acrobat Pro or via Open Office. [ADD 2.12.09 5:24PM] Then the student may post the essay with the teacher's comments on their blog. On two different occasions in the last two days this subject came up, so I figured it was worth posting about. A teacher I was speaking to talked about how difficult it was to read as you were scrolling through a document. Just a bit earlier in the day, I had been in a correspondence with a reader and the same issue had come up. Well, I agree that scrolling and turning pages are two very different things, and I get eyestrain with the best of 'em. That's why I'm really excited about what's going on at the Open Library project. The project, a non-profit run by Internet Archive and supported by the California Public Library, seeks to build a web page for every book ever published. Yes, that's right: every book ever published. To date, we have gathered about 30 million records (20 million are available through the site now), and more are on the way. We have built the database infrastructure and the wiki interface, and you can search millions of book records, narrow results by facet, and search across the full text of 1 million scanned books. Now, in addition to this being a completely audacious project of the highest magnitude, it's also a great lesson in how reading online will be a different sort of experience in the future. Because rather than just presenting the book as text -- like the admirable, but hard-to-read Project Gutenberg -- the books in the Open Library collection have actually been scanned into digital form in their entirety. Once you find the book you are looking for, you can actually flip through the tome just as if you were standing in the dusty old stacks of Widener Library. I can only imagine were this might go with book-shaped PDAs and SmartPaper. Congratulations, you are now ready to begin posting! Click on the 'create post' button and step into a whole new world. If these are the icons you see, then you are in HTML mode. Do not let this frighten you. HTML is 'Hyper-text Markup Language'; it's basically the language that websites are written in. Blogger makes it easy on you by not requiring you to actually 'know' any HTML programming -- it does it for you. If you click on the 'Compose' tab on the right hand side of the box, you'll be in an environment that looks similiar to a word program. You can compose in either. I generally prefer HTML mode. Here's two things to try in your first posts: hyperlinks and pictures. In HTML mode, click on the hyperlink icon. A pop-up box will ask you for the site you wish to link to. Paste or type the link in (keeping http:// at the start) and press ok. Here's the trick you need to know: You must type some text between the two >< at the end of the line of code. This is the text that will form your link. Without doing this, nothing will happen. So, if I were to want my link to be on the word 'click', I would type 'click' between those symbols. As for pictures, you have the option whether to post pictures that you've got stored on your computer or link to pictures published on the web. Just follow the directions -- clicking the adjustments you want to make -- and Blogger will take care of the rest. Experiment with posting links and pictures. You can always remove this stuff by clicking on 'Edit Posts' and deleting what you don't want. So, you have no excuse. Post, post, post! Just how high is that clock tower? Last year I saw a graph that illustrated how much paper we use in relation to the height of our clock tower, and after that I began looking around the office and noticed a huge amount of paper that may have been unnecessarily printed. Here's the whole story of what one man is doing to reduce paper consumption on the campus of Evergreen State in Olympia, WA. When your topics are technological (e.g. programming) then hardware does matter, and software matters even more. For example, your programming exercises may rely on a particular version of some compiler (so that installation instructions, error messages, etc., match the ones in your courseware). In other words, configuration management in the classroom can be a big pain in the neck. Over the years, we have devised clever solutions such as scripts that wipe each desktop clean and run a fresh install of all the needed utilities, and deliver them along with the courseware itself. I'm actually against doing all that much with desktop mounted programs. In fact, I'm skeptical of 'courseware' itself. I see most courseware as the digital equivalent of a textbook. See, that's exactly what we're getting at here: static vs. dynamic. The notion of courseware is that there is a course to be followed and that that course will always be the same. Just wipe the last user's work and install a fresh copy of the same thing. I'd rather see kids and teachers use Web 2.0 to develop their own constantly developing and evolving personalized courses. The problem I am facing now is the technology is advancing faster that I can raise funds. When I finally achieve a class set of laptops they are out-dated. Obsolescence has of course long been an issue with technology. The trick is to know what to purchase to best safeguard against it. Fortunately, we're living in a time where an 'OK Computer' gets you a lot further than it did in the 90's. Well, consider the fact that Quad Core is now the standard in consumer desktops. That's actually sort of insane. There's hardly anything you'd be doing in a school situation where you'd need more than a Dual Core. Blogging, surfing the Net, using Office programs... these are all pretty low-rent strains on your processor. Now consider the move towards the lightning-quick new DDR3 SDRAM. Faster memory? You bet. Necessary? Not unless you are gaming or doing massive video applications. The benefit of all of this is that Dual Core DDR2 computers have now dropped drastically in price. It's sort of like on a new car lot when they make deals at the end of the year to get rid of the left-overs before bringing out the new models. A 2009 Civic is not going to make a 2008 Civic obsolete. It's just gonna make it seem somehow older and less desirable. And that's when you step in and get a deal. I suggest purchasing a Dual Core with the fastest processing speed you can afford. Don't worry about how big the hard disk is: all computers these days have massive hard drives, and you should buy an external drive anyway for storage. Don't worry about disc speed or what type of DVD player is onboard or what type of monitor comes with it. In terms of laptops, as I'm writing this, I'm working on an iBook G4 that you could probably find on eBay for $125. I've done some hot-rodding to it and it works like a charm. I've even recorded two albums on it. Explore the used and refurbished market. The threat of obsolescence is as much a marketing ploy as anything else. Spent the evening mulling over ideas for an image I'd want to grace the top of this blog. 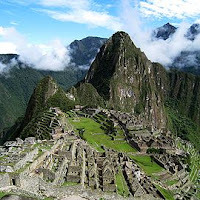 I settled on a picture I took a few years back while on an overseas trip with about twenty-five students. We were high up in the mountains of Delphi -- the home of the ancient oracle of the Greeks. Socrates's buddy Chaerephon had visited Delphi. In fact, that had become a major source of Socrates' problems. In the Apology, Plato tells us that when Chaerephon went up to Delphi, he asked whether Socrates was the wisest bloke around. And, as the story goes, the oracle told him: 'No one is wiser than Socrates'. Of course, Socrates was the first guy to admit that he himself knew 'nothing'. So if 'no one is wiser than Socrates' and Socrates knows 'nothing'... well, you get the gist of why folks got so peeved at him. Well, going over these photos from the trip to Greece, I remembered something else about Socrates: he never wrote anything down. In fact, in the Republic, Plato says that Socrates had a certain distrust of writing. He thought it was too permanent. He thought it was just far too easy to write something down and then forever after to consider whatever was written down to be the absolute truth. In effect, Socrates was scared of knowledge becoming static. That's why he was always hanging out in the Stoa and the Agora. That's why he was always bothering people with all of his questions. Because he recognized something fundamental about knowledge: that it's dynamic and always changing and so dependent upon discussion and deeper and ongoing analysis and re-analysis. I think Socrates would have felt right at home in a paperless classroom. In effect, he invented the first one. Here in Minneapolis, we have a city-wide Wi-Fi system. There is a charge. However, there is something called a 'Community Garden' that is free to anyone with a wireless card. Mostly for community resources and schools. I'd love to see full access given to families that are enrolled in Minneapolis public schools. It's great that Minneapolis has gone Wi-Fi! In terms of the benefit to students, it's really going to be important that they can get connected OUTSIDE OF SCHOOL because that's where things are really gonna happen -- things like the self-discovery of personal responsibility towards one's work and research, a recognition of the global nature of knowledge, and -- perhaps most importantly -- PERSONAL EPIPHANY. Tech patronage programs are a great idea. Here's a place to look for totally reasonable refurbished machines once you get some sponsors. Now you are going to pick a template. Most important thing is that it is something you are comfortable with. You can change it later if you like, and you will be adding pics and moving things around anyway. So, basically, don't spend too much time fussing. Not so fast. You've got some work to do. Let's start by checking to make sure the right name and template appear. Go ahead and click on the 'View Blog' tab. As your sleek new blog page opens, be shocked; be amazed; be somewhat underwhelmed. Thing is, there's nothing really there yet. You first need to configure your blog's settings. 1) Click on 'Customize' in the top right corner. 2) On the next page, click on the 'Settings' tab. We are going to carefully go through the four important pieces of the 'Basic' settings. 1) The name of your blog. You can change this if you want, but hopefully you've chosen such a stunning name that changing it would make you look silly. 2) Add a description of your new blog. Keep it simple. 3) Blog Listings: NOTA BENE -- if this is a class blog, you could set this to 'NO' which will give you more privacy. If it is a personal blog, go ahead and tell the whole world about it. It's up to you and your department's security protocol. Your blog can be as exclusive or as public as you desire. 4) For class blogs, I usually set the drop-down to 'NOT' for letting search engines find your blog. This keeps my work out of the public view, adding a bit of security for my students' online experience. Again, it is your choice. LEAVE ALL THE OTHER SETTINGS AS THEY ARE. Click 'Save Settings'. Do not click 'delete blog' or all your hard work will disappear. Click on the 'Publishing' tab. This is where you would be able to change the name of your blog. But you are not going to do that, so just move on to 'Formatting'. The most important thing here is to set you clock for your time zone. This is especially important if you are like me and use the blog for timed assignments and due dates. Click on 'Comments'. Most important thing here: Click 'only members can comment on this blog'. That's another safety feature. We can set up your blog so that you have no less than three firewalls. It's a good idea to decide the level of security, therefore, before continuing to set up your blog. Also, enter your favorite email address into the box so that each time a comment is left on your blog you will here about it. Most of the other stuff on this page can stay the same, though you might want to decide whether or not your users will need to type a 'Word Verification -- i.e. decode the squiggly green letters -- each time they leave a comment. I happen to find that annoying. Click on archiving. It should be set to monthly. This is a nice feature, because students who were absent can easily access what happened on the blog on those days. NOTA BENE -- Make sure you are clicking 'Save Settings' before leaving each of these pages or all will be for naught. For now, ignore the 'Site Feed' tab. We'll deal with that later. Click on the 'Email' tab. Enter the email address you most often check into the box and save your settings. 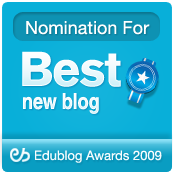 Now, anytime you or a student posts to the blog, you'll receive an email. Please note that for a few weeks, as students are commenting and sending things to you on the blog, you would be wise to check your junk mail just in case things coming from the blog are accidentally being placed there. Skip the 'OPEN ID' tab. We'll deal with that later. Click 'Permissions'. This is the crucial part. It's a good idea to click 'Only People I Choose' as who can read your blog. Again, a safety firewall. 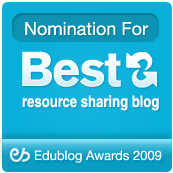 Now, add the email addresses of the students you want to read the blog. I generally have them go one by one while doing independent work and type in their address so that I don't have to. You can also add more blog authors. These are other people besides yourself who can write new posts on your blog. I extend this as an honor to my AP students. It's up to you. Now your blog is secure, meaning that only you and whomever you let become a member can view it and comment on it. Good work. Next time, we'll look at how to post messages on your blog and we'll start looking at the 'gadgets' available. I agree that one day all schools will have one-to-one computers, but right now that is absolutely not the case in many schools. Most of my students do not have computers at home. I would love to see on this blog some ideas about how technology and paperless classrooms can bridge the economic gap in schools. This is a HUGE issue. And I'll be the first to admit that I don't have all the answers. But I've got a couple of ideas. First of all, connectivity is on the rise. In fact, the rapid rise that occurred between 2000 and 2008 is nothing less than remarkable. According to Nielsen/NetRatings, as of June 2008, almost 73% of folks in the US were online. That's over 220 million people. That's up from 124 million in the year 2000. To put into perspective just how many people in the US have connectivity, consider this: the only country with more Internet users than the US is China with 253 million. But those 253 million represent only 19% of the Chinese population! But there remain some quarter of Americans for whom technology remains out-of-reach. This is where local advocacy can jump in. The first difficulty in connectivity is the connection itself. That's why Wi-Fi initiatives such as the Wireless Network in Philadelphia that gives free Internet access to anyone with a wireless card are so important. Anyone concerned with closing the digital divide should petition their local representatives for free and open access to Wi-Fi. Once you are connected, almost everything else can be done online for free. In fact, I will go out of my way to demonstrate over the course of writing this blog that a classroom can go completely paperless for about the cost of a pizza topped with the works. So the second issue is hardware. Luckily, in this age of rapid consumption, there are options for fitting students of any economic background with laptops or PDAs. I'd suggest taking a look at what's available in the refurbished market at Geeks.com. There you'll find laptops for around $400 and refurbished PDAs for as little as $170. Add a $1.50 PDA keyboard to your refurbished Blackberry and you have everything you need to work paperless. Of course the problem with refurbished goods is generally the lack of warranty. And make no mistake: wherever you teach, the machines are going to be ABUSED. Without a doubt, the first thing any school that wants to take on a tech initiative must do is hire a tech officer. Two or more if possible. Maybe you can start with an IT whiz right out of college and one or two parent volunteers. Quickly they are going to become the most popular folks in the school. That said, don't think that you have to be a one-to-one computing school to go paperless. As I've said before, my school has been one-to-one for three years -- which means the Seniors are still bound to pen and paper. Or so one would think. In reality, the nice thing about Internet-based blogs and wikis is that they themselves are not dictated by 'place'. So, if you can get your kids (even in chunked groups) to a school's media center or computer lab, they can post their work online and then access it later whether from home on their family PC or on the computers at the local public library. In fact, you could even schedule 'paperless' sessions for after school when kids are at home in front of the PC or are able to get over to the library. Speaking of public libraries. My wife is an architect. She was just doing a rehab job on an athletic center in the middle of Barclay -- a neighborhood in the shadow of Baltimore's jail. It's a neighborhood wracked by poverty, drugs, and crime. But the city had the vision of putting a new library on the corner next to the rehabbed athletic center. And in that public library in one of the most dessicated neighborhoods in the United States there are computers on which the local kids can connect and take part in the paperless world. Connecting the kids with the available technology is the difficulty. What will 'thinking' look like?